Michael Hochberg with his parents. Michael Hochberg is reunited with Krystyna Jakubowska at John F. Kennedy Airport in New York. 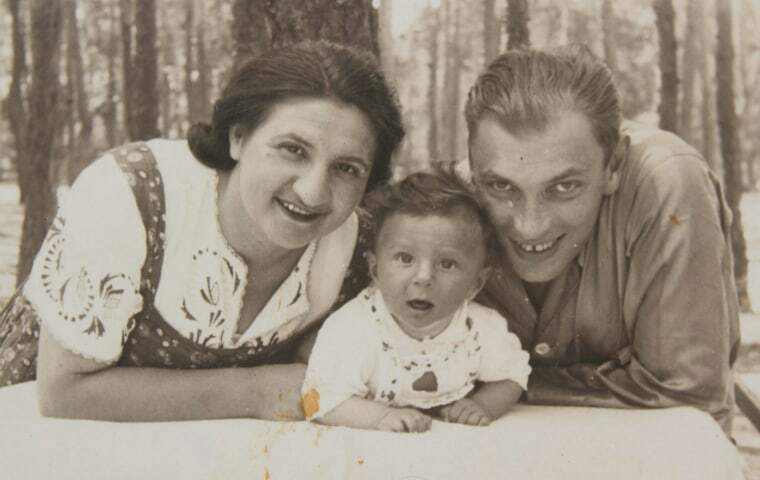 Jakubowska saved Hochberg's life during the Holocaust by pretending to be his big sister. This Hanukkah, Michael Hochberg will be lighting the menorah with a Polish Catholic who pretended to be his big sister — and helped ensure his life was not extinguished during the Holocaust. Hochberg, who is 77 and lives in Israel, will be reunited Wednesday in New York City with Krystyna Jakubowska, who is 86 and still lives in Warsaw. They saw each other briefly in Poland back in 2006. But this reunion, organized by the Jewish Foundation for the Righteous, holds special meaning for them both. “This year, the reunion takes place just days before the beginning of Hanukkah, a significant coincidence as Hanukkah is the story of survival and miracles," said Stanlee Stahl of JFR. Hochberg's life is also a story of survival and miracles. Michael Hochberg as a baby just before the outbreak of World War II. Herded by the Germans into the Warsaw Ghetto with thousands of other Jews, then 4-year-old Hochberg was smuggled out to the "Aryan" side of the occupied city by a family friend and handed over for safekeeping to Jozef and Rozalia Jakubowski, who lived hand-to-mouth with their son Mieczyslaw, and daughters Zofia, Helena and Krystyna. The Jakubowski family was taking a huge risk. In German-occupied Poland, Poles who hid Jews faced the death penalty if they were caught. Hochberg's escape was engineered just before the Warsaw Ghetto Uprising in April 1943. He remembers seeing it burn from the balcony of the Jakubowski's apartment. "I never saw anyone from my family again," Hochberg later told Yad Vashem, Israel's official memorial to Holocaust victims. For the next two years, the Jakubowskis looked after Hochberg, sharing with him their meager rations and only letting him venture out of the apartment at night. If anybody asked, they had a ready answer: He was an orphaned relative. And if the Germans raided the neighborhood, they stashed the little boy in a hideout until it was safe to bring him back to the apartment. Then in August 1944, the Poles in Warsaw rose up against the Nazis. Jozef Jakubowski, a member of the Polish Underground, was killed in combat. The rest of the family were among the hundreds of thousands of Poles forced out of the smoldering city at gunpoint after the Warsaw Uprising collapsed. Krystyna Jakubowska, who helped save Michael Hochberg from the Nazis. But they did not abandon Hochberg. And when the family matriarch died, Jakubowska stayed with Hochberg while her siblings went to the funeral so he wouldn't be alone. It was only after the war was over that the Jakubowski children handed Hochberg over to a Jewish orphanage in the town of Otwock where he was claimed by a relative. In 1957, he emigrated to Haifa where he married, raised three sons, and had eight grandchildren. Meanwhile, Jakubowska had two daughters and a son who gave her five grandchildren. But Hochberg never forgot what the Jakubowski family did for him and made sure they were recognized as righteous gentiles by Yad Vashem.